In the suburbs of Atlanta, Rotarians are filling a gap in social services to help struggling families get back on their feet. It’s a sunny Friday afternoon in the quiet suburbs of Atlanta. Beatrice is at home with her 10-year-old daughter, who is practicing the trumpet. Her older daughter, age 12, is at her first school dance. It’s a rare moment of relaxation for the family amid their usual activities – church, homework, chores. It’s hard to imagine now, but just seven years ago, Beatrice was homeless. 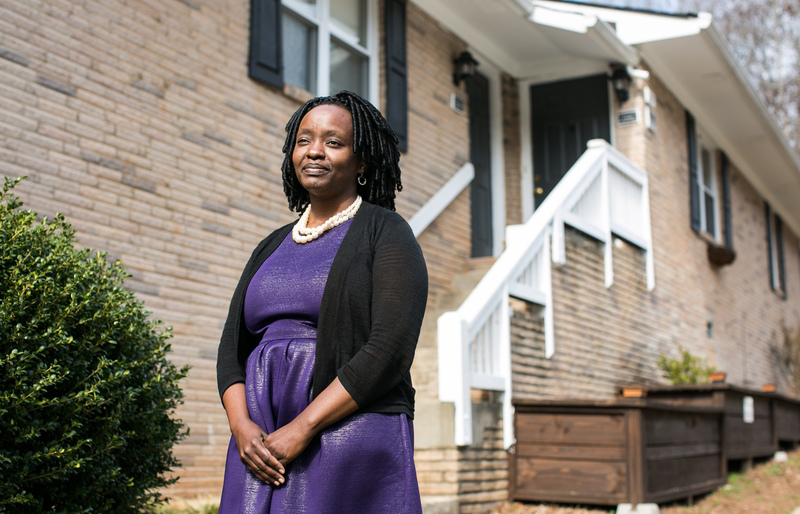 Social service programs, with the support of Rotary, helped her get back on her feet, and today she’s a homeowner with a master’s degree. Editor's note: The names of Beatrice's children have been changed. Beatrice, who was pregnant with their second daughter, scooped up Maya, who was then 18 months old, to shield her from his anger. She had felt her husband’s fury before. Mostly he would yell, but sometimes he would punch a wall. Other times, he had pushed her or thrown something at her. When he went to bed, she called a friend from church who knew about her situation. She whispered into the phone, “Pat, I’m scared for my life.” The women made plans to meet the next day. Beatrice held her daughter and waited for morning to come. This was supposed to be a story about the working poor. But to write about the estimated 10 million Americans who work yet live below the poverty line, you encounter the same people again and again: single mothers like Beatrice. Nearly 40 percent of single mothers in the United States live in poverty. The cost of child care eats up much of their take-home pay, so some move in with relatives or a boyfriend. Others are forced to rent substandard apartments in dangerous neighborhoods. Many minimum-wage workers don’t have health insurance through their employers and are one serious illness away from losing everything. In fact, that’s how Beatrice became homeless: She got sick. After three months in a shelter, Beatrice rented an apartment. She found an internship and was making $15 an hour. Life was difficult for the expectant mother with a toddler, a job, and night classes, but she made it work. Pat watched Maya while Beatrice was at school in the evenings. She continued to work on her degree so she wouldn’t lose her student visa. After losing her apartment, Beatrice lived at HomeStretch, an organization that provides transitional housing along with financial mentoring and life skills classes. Several Rotarians have volunteered there as mentors. In December, she gave birth to a second daughter. Ella suffered from severe sleep apnea and was in intensive care for a week. When she came home, she needed constant monitoring to make sure she didn’t stop breathing. No day care facility would accept the risk of caring for her, and Beatrice’s internship didn’t offer paid leave. Luckily, other friends helped her find another job, and, with her church’s support, she was able to stay in her apartment. When Ella turned six months old, Beatrice started working again. But a month later, she felt a terrible pain in her side and passed out at the office. After emergency surgery for an ovarian cyst, Beatrice developed a blood clot that nearly killed her. Her new employer couldn’t wait for her to recover and replaced her. Once again Beatrice had no income, no insurance – and this time she had $115,000 in hospital bills. She lost the apartment. “That’s how I ended up at HomeStretch,” she says. HomeStretch offers temporary housing for homeless families in the suburbs north of Atlanta. The organization’s units are situated on a quiet cul-de-sac in Roswell, a town with good schools and parks filled with children. Alpharetta Rotarian Glennette Haynes, an interior designer, has donated her services to several graduates of the HomeStretch program. Atlanta’s suburbs are a difficult place to live if you’re poor. There’s little public transportation, affordable housing is limited, and most social service organizations are still based in the city. That’s where Rotary comes in. Where the suburban social safety net has holes, the Rotary Club of Alpharetta fills the gaps. For years, the club has been forming partnerships to bolster the work of social service agencies across north Fulton County. In 2001, the club began supporting HomeStretch, where Beatrice lived for three years. Alpharetta Rotarians also support an emergency housing complex for single mothers called the Drake House. “We develop substantial relationships with our partners,” explains club member Karen Nolan, noting that this makes it easier for the agencies to reach out to the club for help. Club members take on tasks large and small, from providing basics such as food and clothing to helping a family secure a car loan. The club also supports a food pantry at North Fulton Community Charities (NFCC). Alpharetta Rotarian Lee Doernberg, left, arrives at North Fulton Community Charities with donated food. Rotarians Karen Hipes and Jason Binder, right, look on as Doernberg greets NFCC Director, Vonda Malbrough. Every weekday for more than 20 years, a Rotarian has made the trip to Fresh Market grocery store, picked up two or three carts of donated food, and taken it to the pantry. Every member of the club has volunteered to make the delivery. It’s the club’s longest-running service project. “I never have to worry they won’t show up,” says Melody Fortin, the pantry’s manager. Vonda Malbrough, a director at NFCC, says she can call on the club for just about anything: “This is a community of people who will go above and beyond,” she says. NFCC helps families across the county with many aspects of daily living, including food, clothing vouchers, and utility assistance. In the fall, Rotarians pitch in to help stuff backpacks for the children of the families who rely on NFCC’s assistance. At HomeStretch, the Rotary Club of Alpharetta supports one unit – helping pay the rent, furnishing and decorating the space, and providing food and toiletries. When Beatrice lived at HomeStretch, she saw how Rotarians helped in other ways too. Club members fixed up a little garden near her unit. They watched her daughters and other children while she attended a weekly life skills class, a mandatory part of the HomeStretch program. I built my whole company by finding diamonds in the rough. I find those employees to be fiercely loyal because they appreciate the opportunity. HomeStretch relies on a network of community volunteers, including Rotarians, to run its financial mentoring program. Sidney Browning, a financial planner and a member of the Rotary Club of Alpharetta, mentored Sophelia, a single mother with a teenage son. He taught her the basics of budgeting and how to pay down debt, but soon realized she would continue to struggle without stable employment. Sophelia primarily found work through a temp agency but couldn’t meet her monthly expenses when her hours fluctuated. Browning thought of all the business owners he knew through Rotary and realized the club’s partnership with HomeStretch offered another opportunity: a source of screened candidates for Rotarian employers. Jim Coyle, a member of the Rotary Club of Roswell, hired Sophelia to work in data entry at his firm, which automates revenue processing for the health care industry. “I built my whole company by finding diamonds in the rough,” Coyle says. “I find those employees to be fiercely loyal because they appreciate the opportunity.” For her part, Sophelia was thrilled to have health benefits. “I couldn’t remember the last time I had insurance,” she says. When he read about a successful microcredit program, Launch Detroit, in the September 2014 issue of The Rotarian, Binder solicited advice from its founder, Michigan Rotarian Larry Wright. After talking with Wright and consulting other Rotarians with financial backgrounds, Binder came up with a proposal – a low-interest car loan program for families at HomeStretch and the Drake House. “Most of the residents are credit risks, so we’re working to find a way that the Rotary club can buy off that risk,” explains Binder. “We provide funds upfront and buy down the interest rate.” The purchaser enjoys a lower interest rate and begins rebuilding her credit. The club has provided seed money for the new program, which will be managed by a local credit union. Access to a car is incredibly important, especially in the suburbs. “This will open new opportunities for employment, more flexible schedules, less travel time, and better accessibility to child care,” adds Swahn. In 2010, Beatrice graduated from the HomeStretch program. In just three years, she had paid down most of her debt and restored her credit enough to qualify for a home through Habitat for Humanity. On her graduation day, Rotarians were there again – providing a meal after the ceremony and handing out bags full of items for her new home. Beatrice now owns a home built by Habitat for Humanity. Her girls enjoy the stability of a safe neighborhood with good schools. Today, Beatrice has a job as a senior accountant at an international school. She earned a master’s degree in public administration last year by taking night classes. Money is still tight and there’s little time for anything aside from work and raising her girls, but life is stable. When they moved into their Habitat house, Maya, then six, was relieved. “Now I can learn my address,” she said. “We don’t have to move anymore. ” While they were at HomeStretch, therapy funded by Medicaid helped Maya cope with constantly shifting living and day care arrangements. When Beatrice tells her story, she attributes her success to her own hard work as well as the organizations and people who helped her. “There are very few social services in Alpharetta. They are almost a secret – no one even imagines there are Habitat homes here,” she says. But supporting social services in suburban areas is a key part of addressing homelessness, and Rotary clubs are positioned to help fill the gaps.